Tata Steel Ltd reported weak results, as expected, for the September quarter. Consolidated revenue fell 9.3% quarter-on-quarter to $6.7 billion (around ₹ 33,370 crore today), but things look a little better in the domestic currency terms, owing to the rupee’s depreciation. In rupee terms, revenue fell by 1.3% sequentially to ₹ 32,507 crore. Tata Steel Europe, which accounts for about 65% of the consolidated revenue, reported an earnings before interest, tax, depreciation and amortization (Ebitda) of merely $30 on a per tonne basis, down from more than $70 in the June quarter. Its absolute Ebitda fell nearly 60% to $103 million, at a wafer-thin margin of 2.4% of revenue. But the sharp drop in profit in the European operations was largely expected—analysts at Emkay Share and Stock Brokers Ltd had even predicted a loss for the September quarter, while UBS AG had said the company will achieve break-even. In that backdrop, the company seems to have done well to manage an Ebitda—a key measure of operating profitability—of more than $100 million. UBS, which had among the most bearish estimates, had predicted an Ebitda per tonne of $375 for local operations. Apart from rising raw material costs, Indian operations were also affected by a decrease in dispatches at its ferro alloys division, which was hit by both internal operational issues, as well as lower demand from China. Tata Steel shares have been languishing this year and the results will do little to lift the spirits of investors. In fact, the outlook continues to be bleak. In India, with the commissioning of the expanded capacity at Jamshedpur in Jharkhand getting pushed to March 2012, volume estimates may need to be lowered. In Europe, things need to get only slightly worse for the company to slip into losses. 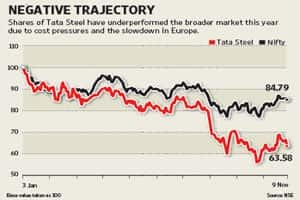 Despite the sharp correction in Tata Steel’s valuations, investors are likely to stay on the sidelines and wait for more clarity on the European steel industry front.